Destiny Mobile is the highlight of our patrol software suite. Destiny Mobile offers your company a means of reporting, tracking, and communication. 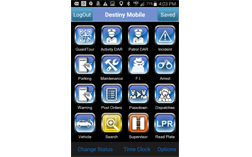 Utilizing Destiny Mobile, your employees can create reports, receive dispatches, scan Guardtour codes, and more. As an Admin you are able to verify your employee is where they need to be via real time tracking. Destiny Patrol software is a suite of apps designed to create a successful organized business. 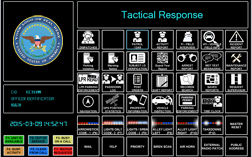 Our Patrol software includes apps available on Windows and both major mobile platforms (Android and iOS). In addition to our suite of apps we offer online terminals for access to reports anywhere with an internet connection. With the use of GPS satellites and an array of sensors, Destiny is able to maximize work flow and manage your fleet. With the use of specific sensors Destiny can determine the consumption of gasoline, if a driver is speeding, when a door has been opened, etc. 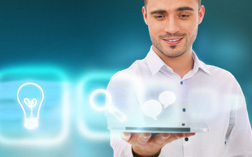 These are only a few features that we utilize to optimize your company’s future. 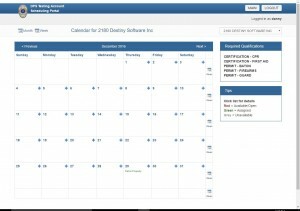 Destiny Software now offers our clients an easy alternative to employee time management. Utilizing your company’s user base, you can easily create schedules for each of your employees for every account you have, calculate how many hours they worked within a set period, and employees are able to view all set shifts within our employee portal. We here at Destiny understand that our product may not offer everything you could want and to remedy this we are open to suggestions! If you can offer an idea that we deem would be beneficial to all of our clients we will incorporate it as soon as we can with no extra cost to you or we offer custom solutions tailored to your specific needs. Our Desktop app was designed with ease of use in mind but optimized for maximum functionality. ADAM 602 is the most robust of our applications offering all of our reports and access to Dispatch using a Windows based computer(Traditional Laptop or Microsoft Surface Pro). Our Mobile app is NOT a web based application or web page that does limited functions, but an actual application that runs on the Android and iPhone Operating Systems, and will allow you to do a multitude of tasks that cannot be done from a web page based service. You can save reports to your smart phone even with no signal, this is not possible with a web based service. With use of our web terminals our subscribers have access to every report created by their employees along with separate terminals for their clients to view reports. Every Web Terminal generated can be custom created to limit view of certain features. 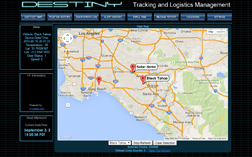 Destiny uses GPS satellites to generate a driver report of exact routes used with timestamps to ensure all cargo is delivered without delay. We also use sensors to determine when a door has been opened to determine when the load is handled in an undesignated area. License Plate recognition is a technology we are perfecting in an effort to assist all our clients with parking management. Our LPR program integrates between all of our reporting software and utilizes our servers to provide information almost instantly. Our PTT System utilizes Android devices AND Windows Computers, but what makes us different from all of the others is that we have actual hardware for mobile applications, it’s an actual two way vehicle radio, with a volume control, on/off switch, integrated speaker, and palm microphone, all in one unit, that plugs right into the USB port of your Windows Computer. Established in 2006, Destiny began as a software company that catered to the security industry, however, as we continue to grow we expand our services.